Some critics of the doctrine of the Trinity object to the doctrine because the word “Trinity” does not appear in the Bible. This article explains why Christian apologists maintain the objection bears no persuasive weight. In response to the criticism that the doctrine of the Trinity is questionable because the word “Trinity” does not appear in Scripture, Christian apologist, R.C. Sproul, argues the important thing isn’t whether the word “Trinity” appears in the Bible; rather, the important thing is whether the concepts represented by the word appear in the Bible. As noted by some, the word “Bible” isn’t even in the Bible but was a term which developed over time to refer to a specific collection of sacred texts. Bible scholar F.F. Bruce reports that John Chrysotom (c. 347–407), the Archbishop of Constantinople, appears to be the first writer to use the Greek phrase ta biblia (“the books”) to describe the Old and New Testaments together in his Homilies on Matthew (dated between 386 and 388). 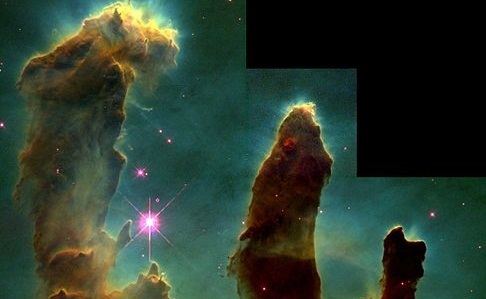 Slideshow Photo: This photograph taken by the Hubble Space Telescope in 1995 depicts the region of the Eagle Nebula commonly referred to as the Pillars of Creation. The image was downloaded from www.wikimedia.org which states the the file is in the public domain because it was created by NASA and ESA (and ESA Hubble material prior to 2009) is copyright-free and may be freely used as in the public domain without fee, on the condition that only NASA, STScI, and/or ESA is credited as the source of the material. 1895 Bible: This photo of a 1895 family Bible taken by David Ball was downloaded from www.wikimedia.org which states the image is licenses under the Creative Commons Attribution-Share Alike 3.0 Unported license. Subject to disclaimers.